Nice job, particularly for a school project! Things have changed since I went to school. I think I made a strobe light and a one-transistor power supply back then. I never heard of a 3D-pen until I read this hack. I hope this robot vacuum you’ve made works better than the early version famous brand model I bought a few years ago did. I’d do a credible job of cleaning a room but I’d then have to spend an hour cleaning the dust and hair it sucked up from its innards, only some of which made it into the bin, the rest got jammed into every possible corner of the works. I’d spend more time cleaning it out after each job than I would just pushing an old $50 floor vac around my apartment, and it wouldn’t need to be cleaned out for months or years, if ever. I hear the newer ones are better, but I think I’ll wait until they can clean themselves out and empty their own bins before I’ll buy another one. Or build one of my own, now that I know it can be done. The laser rangefinders used in the xiaomi robot vacuum are available pretty cheaply and give good resolution. They pump out an awful lot of data though so an ARM SBC might be needed to process it. An Xbox One just became more useless than it was before. I think that the next step is to customize the size and shape to fit other uses and create a family of robots based on the same components. For example I’m thinking for a while about a very small footprint that can be taller in the Z axis that can be used in small spaces like bathrooms etc. If you look on some models of iRobot (less popular) and also the relatively new Dyson they are following that trand. I’m thinking those sharp corners are going to make a mess of any woodwork they hit. I’d say that the biggest issue of robot vacuums is that most houses have rugs, and so you need a drive train that can handle the height differences. Also, cat hairs tend to stick to rugs, and you need a lot of suction force to clean the rug from cat hairs. Probably a rotating brush or something. I have always felt that everyone with a vacuum robot ends up adjusting their house to tailor for the robot’s special needs. But I like to have a rug in my living room, AND I have a cat. Consequently, I’m still vacuuming my house myself. our Roomba 980 does a phenomenal job keeping up with 2 cats, only need to run once or twice a week. The house is about 2/3 hard floors (with some rugs, but far less than half of hard floor is covered in rugs), 1/3 carpet. We don’t really have to do much in the way of altering our behavior for the roomba in ways that wouldn’t be necessary for regular vacuuming (i.e., don’t leave cat toys / shoes / etc on the floor since they’ll just get in the way). It ain’t cheap, but it works. 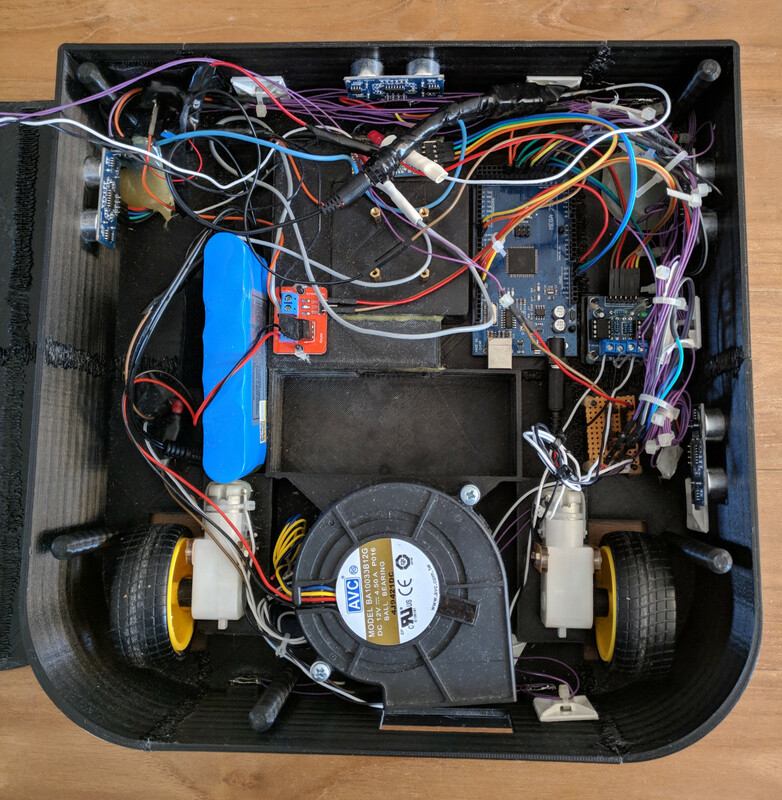 Impressive for a homemade robot vacuum, although I’m not sure how well it would get into corners or under furniture!